Dimensions 14.41" x 6.65" x 1.54"
This is a very good keyboard - solid build quality, excellent keycaps, nice quiet switches, high quality stabilizers, etc. Whether this keyboard is worth the cost depends in part on how you view Topre switches, which are very polarizing. Those who are "one with cup rubber" will find that this keyboard does just enough to justify the cost and nothing more. Others who aren't as impressed with Topre will find this keyboard comically overpriced, especially when there are very solid Cherry MX boards on this website under $100. As for me, I'm somewhere in the middle. I like Topre but I don't like it that much more than MX Browns. I don't regret purchasing this keyboard, but there's no way I could say it was worth every penny. In fact, I would recommend a cheaper Cherry MX or Matias board for someone just getting into mechanical keyboards. The Realforce is more for enthusiasts with disposable income or those who have tried but don't like other switch offerings. This keyboard has variable weighted switches. There are 30g switches installed on the keys for your pinky and ring fingers, 45g switches on the keys for your middle and index fingers, and a lone 55g switch on the escape key. So how do they feel? The 30g switches are light and have a very minimal tactile bump that pales even in comparison to MX Browns. They feel virtually linear as a result. The 45g switches have a nice round and snappy tactility, rounder than MX Browns but also noticeably more tactile. There's a lone 55g switch on the escape key and is even more tactile than the 45g switches. 55g switches could be nice if you're a more heavy-handed typist. Anyway, your experience with the variable weighting may vary on your use case. I could see the variable weighting being somewhat odd for a competitive gamer or for someone who isn't a textbook touch typist. Personally, I went with variable weighting because I found uniform 45g Topre boards to be too tiring for my pinky and ring fingers and this variable board pretty much solves my fatigue problem. But wait, 45g is really light for a mechanical key switch, how could I find that tiring? Well one thing you should know is that the stated actuation force of Topre switches is very inaccurate. 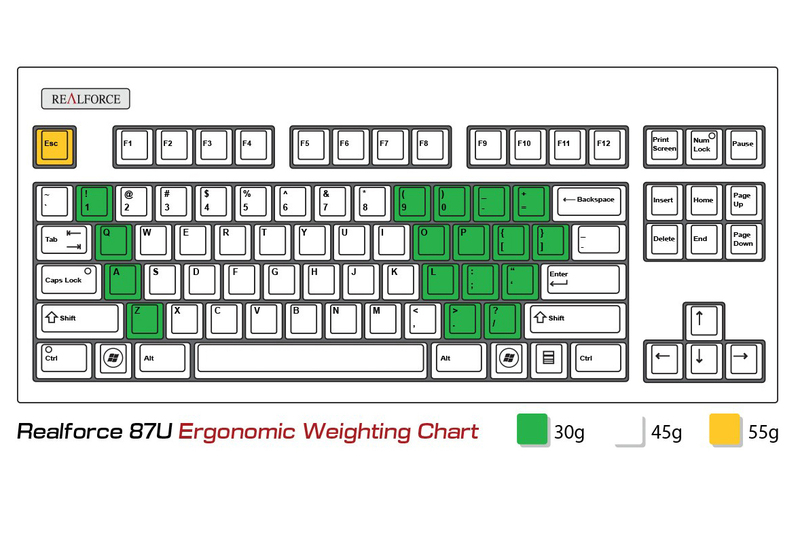 Topre has a /- 15g tolerance for the weighting of its switches, and this results in many of its switches being heavier than its stated weighting. For instance, Tom's Hardware did a review of a Realforce 104U and discovered that the weight of its switches was typically 10g higher than their stated weightings (30g switches actually ranged around 40-49g, 45g switches around 52-62g, and the 55g escape key weighted around 71g). The take home message from this is that if you're getting into Topre, expect the switches to be somewhat heavier than their advertised weighting. Finally, another thing of note is that Realforce 87Us seem to come with wobbly left CTRL keys, being very noticeable when you're purposefully trying to wobble them. Mechanicalkeyboards.com sent me two Realforce 87Us and they both came with wobbly left CTRL Topre switches. After some googling, it appears that this is a common manufacturing defect from Topre themselves. This isn't noticeable in real world use, but for such an expensive keyboard, you'd think Topre would have much more consistent quality control. But alas, this is still a quality keyboard and I'm happy to have used one for several months. Just don't tell the SO how much it costs.